OCEAN – LIKE AIR! poster campaign. 4] GREETING CARD: cards design, made in any manner, printed or handmade are allowed. 1] POSTER: No restrictions on printing technique. The size of the poster – 700 mm x 1000 mm. (horizontal or vertical). Please, sign your work in the lower right hand corner (year, author name, country. Font: 8pt not more). 2] LOGO: for exhibition you need to provide high-quality print of presentation your work. One logo on one sheet. Printer’s sheet size should be 300x300mm. Paper density 270-300g/m2. Black color border width 45mm (please, see SAMPLE OF DESIGN WORK FOR THE EXHIBITION, for more information about design your presentation). 3] PACKAGE DESIGN: original work or presentation your work printed on sheet format А3. Paper density 270-300g/m2. Black color border width 40mm (please, see SAMPLE OF DESIGN WORK FOR THE EXHIBITION, for more information about design your presentation). 4] GREETING CARD: original work designed on format A4(A3) black background (no more 300g/m2) or presentation your work printed on sheet format А3. Paper density 270-300g/m2. Black color border width 40mm (please, see SAMPLE OF DESIGN WORK FOR THE EXHIBITION, for more information about design your presentation). NOMINATION LOGO: One logo on one sheet. Printer’s sheet size should be 300x300mm. Paper density 270-300g/m2. 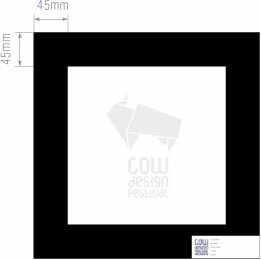 Black color border width 45mm. NOMINATION PACKAGE DESIGN, GREETING CARD: presentation your work printed on sheet format А3. Paper density 270-300g/m2. Black color border width 40mm. Participation in the Festival is free. Works that have passed the preliminary selection will be participate in competition and exhibition program of the festival. Diplomas and other awards we will be happy to present to the winners at the award ceremony or send by e-mail. To receive the original of Diploma after the award ceremony, you need to pay the administrative fee of EUR 10 (for non-residents of Ukraine) and shipping cost by postal service. EUR 15 for poster 700 mm x 1000 mm. All postage has to be covered by the participant. For organisational reasons, works, prototypes, presentation, posters and any other items shall not be returned unless it is specifically indicated during registration. To return, an administrative fee of EUR 15 will be levied and entrant will bear the cost of delivery.